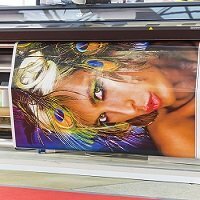 Estimating wide format print jobs can be tricky -- particularly if you produce many different types of wide format prints instead of specializing in one or two niche products. You don’t want set your prices too low that you win jobs that will be unprofitable. But you also don’t want to lose jobs by quoting jobs well above what your competitors offer. Some clients do award jobs to companies with mid-range prices if they can clearly see that your company offers more value and other services than the shop with rock-bottom prices. Use these strategies to avoid common pitfalls. Understand your actual production costs for different types of prints. Wide-format printing is different from conventional commercial printing. You can easily lose money on a job if you don’t take into account all of the variables that can affect the production of different types of wide-format print jobs. For example, prints with large, full-color images consume more ink than a print with just a few lines of big text. Prints on inkjet canvas will use less ink than prints on a resin-coated photo paper. If the printed graphic will hang from the ceiling and be viewed briefly from a distance, the print quality doesn’t have to be as sharp as museum exhibit prints that will be studied up close. When the print simply requires “good-enough” quality, you can run the job in a faster production-printing mode. If your staff isn’t trained in color management, you could waste a lot of time, ink and media making test prints and reprints of jobs that require accurate brand colors. Likewise, you can incur high waste costs by not filling the entire width of each wide-format roll with income-generating prints. Know how and when to offer discounts for larger print runs. If you have clear pricing strategies and knowledge of actual production costs, you can assess when it is economically viable to offer customers a 10% or 20% discount for ordering a higher volume of prints at one time. Emphasize the extra value of special services you provide. As other shops continue to add newer, faster printing printing devices, there will be instances in which your estimate won’t be quite as low as your competitors. To guard against commodity pricing, emphasize special services your company provides. Maybe your team includes a superstar designer who can suggest innovations that make large-format prints more interactive and measurable. Or perhaps your company can warehouse some prints and deliver them as needed. Make sure your quote mentions any special services included in the price. Quote the type of print instead of the technology that will be used. It’s great to make customers aware that your shop uses a mix of printers that can produce a full range of jobs. But your customer really doesn’t care whether a poster is printed on a roll-to-roll wide-format inkjet printer or a digital press that can output B2 size sheets. You need the flexibility to run the job on whichever type of equipment can meet the quality and delivery expectations for the job at the lowest cost. Offer “special” pricing to certain clients. You can quote higher prices to hyper-detail-oriented customers who may expect you reprint jobs that have small flaws. And you can offer lower prices to loyal, easy-going customers who can bring you additional business in the future. Use print estimating software for most jobs. You must deliver quotes quickly. If the wide format print graphics will be part of a special promotion, the print buyer will be juggling multiple deadlines and coordinating services from many vendors. Unless it’s a huge, complicated wide format print job, print buyers don’t have time to wait for multiple bids and evaluate each one in depth. The right print estimating software makes it easy to track the cost of the different variables and quickly assemble a price that will be profitable. Creating estimates for wide format print jobs is still an art. Relationships also matter, because your clients have must trust that you can deliver a color-accurate job and install it as promised. Hiring the lowest-priced bidder won’t matter to clients if graphics are late or look wrong.